This delicious no-bake seven layer “breakfast cake” features the unbeatable flavour combination of unsweetened cocoa powder and fresh strawberries. A simple, fluffy buttermilk pancake batter then turns it into the perfect breakfast or brunch treat. Heat medium skillet on medium-high heat; spray with cooking spray. Pour 1/2 cup batter into skillet; spread into 6- to 6-1/2-inch pancake; cook 2 to 3 min. until bubbles form on top, then turn to brown other side. Transfer to parchment-covered baking sheet. Repeat with remaining batter to make 7 additional pancakes. Beat cream cheese, icing sugar and cocoa in medium bowl with mixer until blended. Place 1 pancake on serving plate; spread with 1/3 of the chocolate cream cheese mixture. 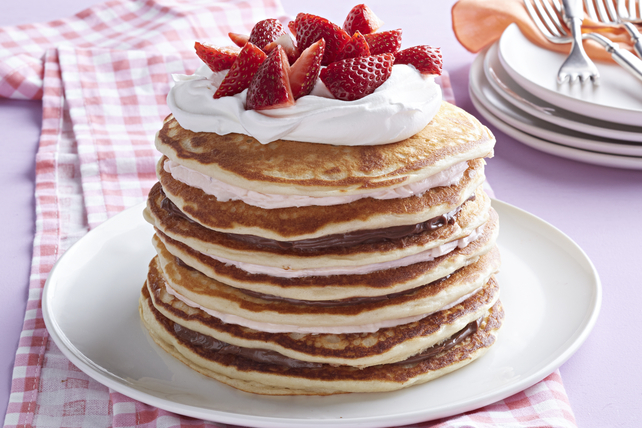 Top with second pancake; spread with 1/3 of the strawberry cream cheese product. Repeat all layers twice. Cover with remaining pancake. Top with Cool Whip and strawberries just before serving. These pancakes can be cooked up to 4 hours ahead of time. Cool, then wrap in foil and refrigerate until ready to use as directed. For best results, try to make all pancakes the same size. This recipe can be part of a balanced diet but remember to keep tabs on portions.